Primary sources of historical information are original records or first-hand accounts. 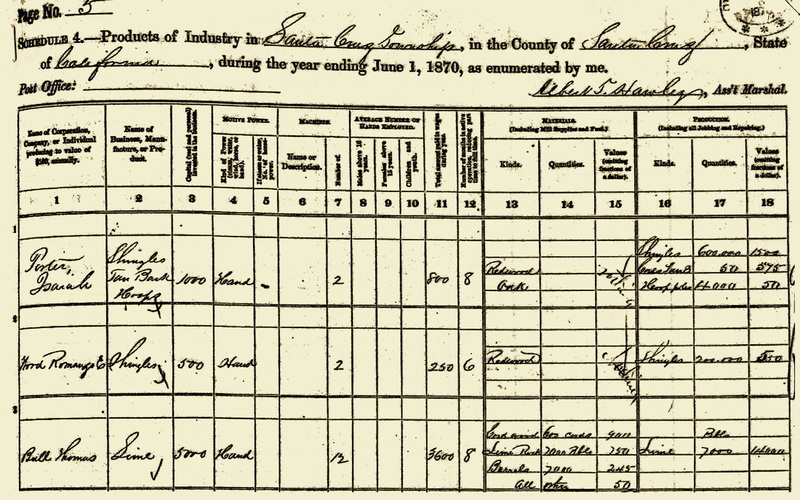 Examples include census records, deeds, diaries, and newspaper stories from the time of the event. Secondary sources are works written about history. Most books on history fall into this category, unless a first-hand account. Newspaper and magazine stories about a historical event written many years later are also secondary sources. Since stories can change with each retelling, it is always better to use primary rather than secondary sources in historical research. Available at the Santa Cruz Public Library and various other institutions, these printed indexes are a useful key to historical information. Keep in mind that your research topic may be indexed under multiple people and subjects. For example, to research the sugar industry, it would be wise to look under sugar, agriculture, sugar beets, Spreckels, industry, Soquel, Watsonville, etc. After doing more research, you may discover additional subjects and people to look under. If possible, don't rely on just one source. Search out multiple lines of evidence. For example, a photograph may be identified as being of a particular person or structure, but there is always the possibility that it was identified incorrectly. This even holds true for photos in institutional collections and for commercially mounted photos with the identification printed in the picture. It is always best to double-check identifications, especially if it is something unusual. Develop an organizational plan early in the project so as to avoid having to reorganize the files later. The required level of organization is directly proportional to the size of the research project. While good organization is always desirable, large projects demand it. Don't hesitate to make multiple copies of the same document so you can file it in more than one location. This can make it easier to find it later. A newspaper obituary, for example, might be kept in a chronological file of all newspaper articles and also in a file on that person. Your research is valuable. After you are done with the project, consider depositing your files in an institution where they will be available to future researchers. Try to organize the files so that they can be used by others. Although much as been written about Santa Cruz County History, there remain an endless array of topics for future research. The best books and articles are those where the author benefited from outside reviewers and editors. Try to find others knowledgable on the subject to read your manuscript. If you have some friends who are good writers, have them read it too. This will result in a higher quality product and help you avoid embarrassing errors. It is a good idea, however, to tell the reviewers not to share the unpublished work with others. This should be common sense, but there is the possibility someone will do so unless you tell them not to.